I don’t know if it’s the latest craze or not, but I jumped on the compost bandwagon a little over a year and have loved it! For those who don’t know, composting is a means of putting kitchens scraps and biodegradable items into a pile or bin with some dry materials, like leaves or shredded paper, in order for it to break down into nutrient-rich soil. This soil can then be used in gardening: as a soil conditioner, fertilizer, and natural pesticide. It is also useful for erosion control, wetland construction, and as a landfill cover. Basically it’s good stuff and keeps 70% of your household waste out of our landfills. I personally hated to see all my scraps go into the trash knowing I COULD just toss them outside to decompose so they could go back into the land they came out of. And ever since my family went paleo in November, I pretty much cook 3 squares a day from scratch, which means LOTS of scraps to be had. I knew the random pile would be an unsightly mess, so when I came across this post from Young House Love, I was inspired to make a compost bin myself. Let me tell ya-it was super easy! I don’t know if it was smart to start it in the winter but when I get a task set in my mind, there’s no holding back (just ask my hubby)! There are basically 3 ways that most people compost and I will show you each one adding my pros and cons. 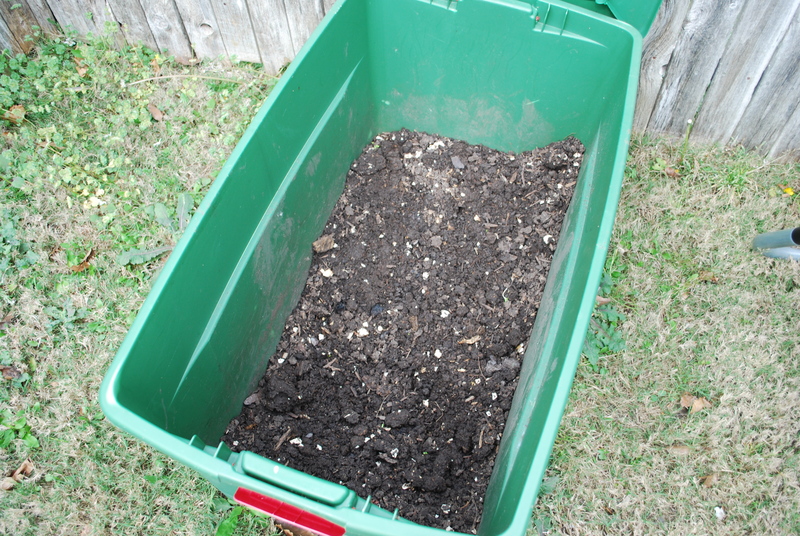 The first composting I did was in a plastic bin in the corner of our backyard. You will want to get you a good-sized bin to start of with. As you can tell, mine was during the holiday season, so I chose the green and red variety since it was the size I was looking for. And since I did this over a year ago I don’t have the breakdown to show you how I made it, but I will post how they did each step on YHL; or you can head over there yourself if you’re a visual learner like me. 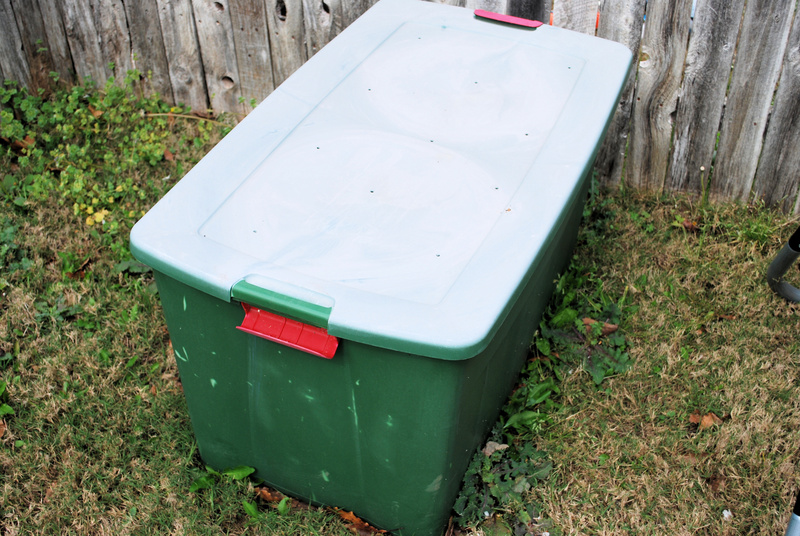 Step 1: Recycle or buy a plastic bin with a tight-fitting lid about 24 inches tall or taller (it needs a lid to keep the soil moist and to keep critters out). They picked up this Rubbermaid version at Lowe’s for $7 in hopes that the neutral color would help it blend in with their backyard. Step 2: Use a drill to make 8 – 10 small holes in the bottom of the container for aeration purposes. Step 3: Place some shredded newspaper or dry leaves on the bottom of your compost bin, filling it about 1/8 – 1/4 full. Step 4: Place dirt on top of the leaves or newspaper until the container is 1/2 full. 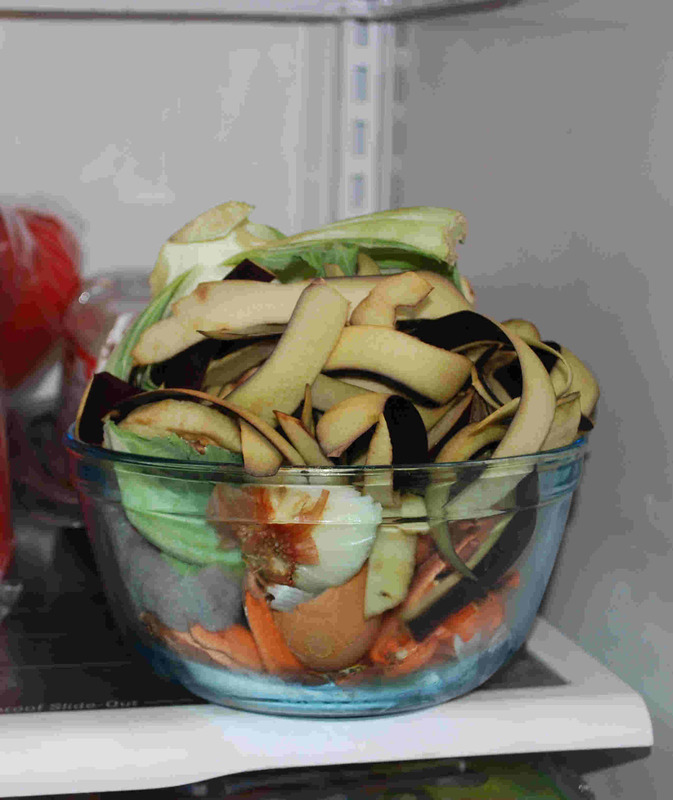 Step 5: Now place any food scraps or paper products that you’d like to compost. Check out this list and this crazy list for a pretty complete run down of what you can and can’t compost. Surprisingly, things like lint, hair, and eggshells are compost friendly, while lime (too acidic) and dog “waste” (could carry disease) are off-limits. So far they only collected a couple of banana peels and a small ball of lint. Step 6: Give your compost a little stir with a shovel or stick, making sure to cover your food scraps with dirt. Step 7: Spray with lukewarm water until moist, but not soaking wet. (Note: too much water can be the culprit if your compost starts to smell). Step 8: Use a drill to make 8 – 10 small holes in the lid and place it securely on top of the bin. Step 9: Place the bin in a shady area away from the house (if you live in an apartment or have no backyard you can place your bin on the patio). Be sure that it’s not in full sun or your compost will dry out. Step 10: Now that your compost bin is set up, you can just add food scraps when you’ve got ‘em, making sure to give things a stir each time (mixing the compost helps break everything down faster). And to aid in your collection of stuff to compost, they’ve added a special “compost” receptacle under the sink (along with our existing recycling and garbage containers). Gotta love a no-fail way to get in the compost habit. Here is mine after a year or so of just sitting and decomposing. It looks a little dry because I opened the lid to let it air out a bit in the hot Texas sun and to help get rid of the gnats. And now that my compost is ready I have been using it to mix with the potting soil to make my small container garden. Success! This is my latest composting beast; an 80-gallon tumbler I found at Costco for $100 (pricey, I know). It was my hubby’s idea since he was tired of the space the bin took up and thought this might be easier for me to turn (the bin was tough even with not much in it). I’m still in the process of letting it decompose but it’s hard because I constantly have scraps to put in there so it would be nice to try the new double tumbler that Costco is coming out with this month-so you can have one breaking down while the other gets fed scraps. So far, I am liking the ease of dropping in my scraps and turning with the nifty handles they added on each side. I will note that when I had my bin, I use to store scraps in a plastic container on the counter until it was full. That was about the time it started to mold from the condensation and get funk nasty. What I do now is store them in a designated bowl in the fridge, and once that’s full, I make the trek out to the tumbler-usually every other day or so. A third option (though I know there are several others like worm composting) is the compost pile. My friend Denise, whom I’ve known since the Jr. High tennis days, has done a compost pile to go along with her gorgeous garden. I asked her a few questions to see what inspired her to go green. 1) What prompted you to start composting? What did your hubby say? I wanted to start composting because I noticed that I could reduce my trash load by over half if I started saving all of my vegetable scraps. My hubby is supportive of any environmentally friendly things I want to do around the house, but still loves to tease me that I am such a nerd about it! 2) How did you decide on the option/container that you did? Was is cost, convenience, or ease? I first started my compost bin when I lived in a 3 story townhome. I used a container on the balcony to keep all of my scraps. After a visit to Home Depot, one of the employees recommended I use Blood Meal to help stimulate breakdown and microorganism reproduction. However, I noticed black arthropod looking worms everywhere! It was hard to turn the contents of the bin on the balcony, and the bin wasn’t breaking down fast enough. Shortly after, we bought our first house and I decided to make a pile. It was much easier to use and since it was outside, I didn’t have to worry about how “messy” it was. I still wish I had multiple bins (instead of 1 large bin) because it is still hard to turn, and I can’t get down to the broken down dirt at the bottom of the pile. 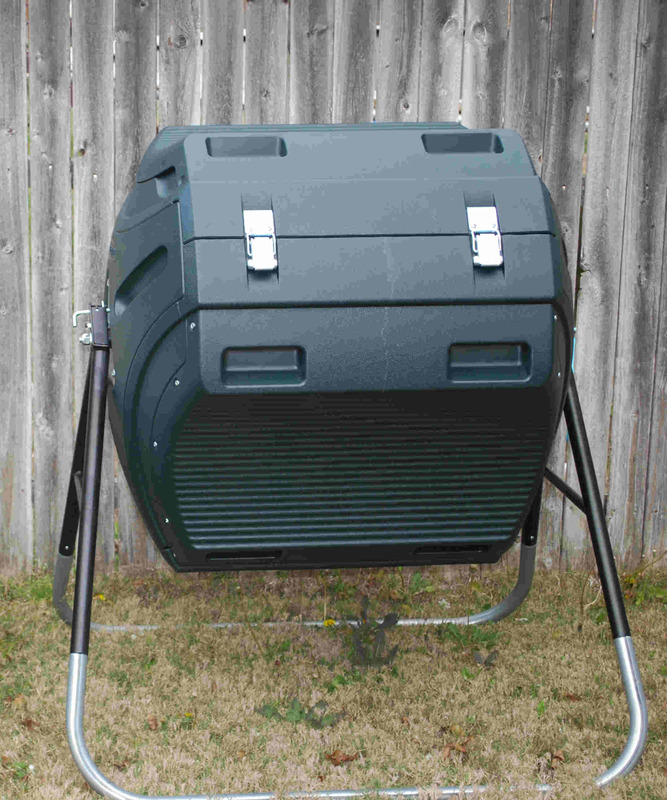 I would really like to get a commercial compost bin that turns so that I can help speed up the process and keep the amount of my pile manageable, but I don’t want to pay $100+ for it! 3) How/where do you store your scraps until it’s time to put them in the pile? I have a small compost pail that I keep under my kitchen sink that I throw all of my freshly used scraps in. When I remember to, I take the pail outside and add it to the pile. 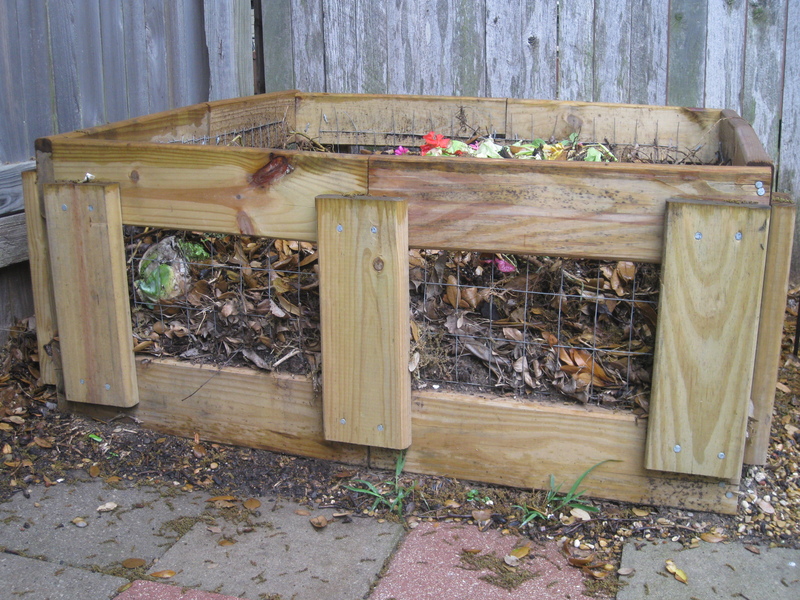 4) What tips or new findings did you discover as to different items that can be composted? As I mentioned before, I go to Starbucks and ask them for a bag of their coffee grinds to add to my pile. It helps with the pH level of the pile and makes the best soil when it breaks down. I also add organic Blood Meal occasionally to add nitrogen to the pile. *Thanks to her tip, I stopped by a local Starbucks and got a huge bag of coffee grounds and tossed them in the tumbler when I got home…sure made my trunk smell good! 5) Since composting, has anyone else you know been inspired to start their own or do they think you are crunchy? Most people just think I am “crunchy”! Hey, that’s not a bad thing! 6) Any advice to someone who is looking into composting but think it’s beyond them? 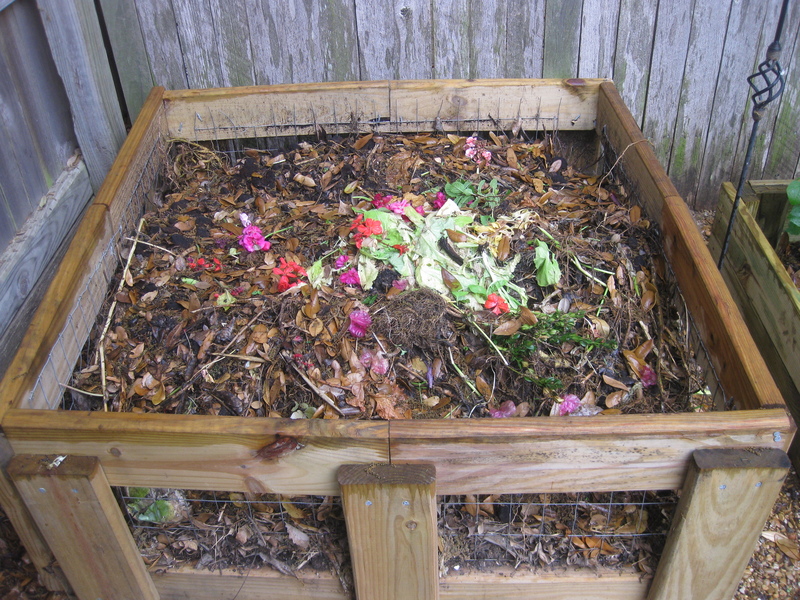 Composting is easy and will reduce the amount of waste you produce tremendously. Yowza! That sure was a whole lotta talk about trash…but I think it’s a good one. Alright, now it’s your turn to talk trash to me. Do you compost or have you thought you’d like to try it but were too intimidated? Now you have three different methods to choose from and I guarantee there are a thousand more ways to get your compost on (see Pinterest or Google for ideas). So give it a shot! No excuses peeps. Let’s all do our part to save the landfill and environment one scrap at a time. We need to set up a date to talk about composting when I’m back in town!! In the first option, can you add worms?